On Thanksgiving Day in 1976, the legendary rock group The Band (Robbie Robertson, Levon Helm, Garth Hudson, Rick Danko, Richard Manuel) took the stage for the very last time at the Winterland Theatre in San Francisco. 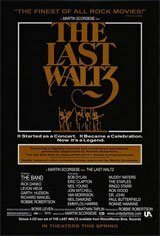 Produced by accomplished rock promoter Bill Graham, the concert was billed as The Last Waltz, perhaps as a final statement on what is arguably the most powerful and innovative era in rock history. With an intricate 300-page shooting script, director Martin Scorsese, director of photography Michael Chapman, and a team of seven cameramen recorded the landmark live event for the first-ever 35mm feature length concert documentary. The Last Waltz has been called the greatest rock n' roll film in history. Featuring performances by Paul Butterfield, Eric Clapton, Neil Diamond, Bob Dylan, Emmylou Harris, Ronnie Hawkins, Dr. John, Joni Mitchell, Van Morrison, The Staples, Ringo Starr, Muddy Waters, Ron Wood, and Neil Young.